The Great Dane is well known as one of the largest dog breeds. As you might imagine, this large dog comes with a large price tag too. 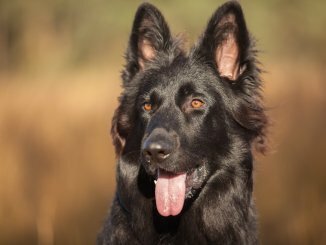 With their friendly demeanor and excellent temperament, most people are surprised to learn that these dogs were originally bred in Germany to take down boars. As a result of their large size, they receive plenty of attention but it’s also their downfall when it comes to your bank balance. But just how much does a Great Dane cost? 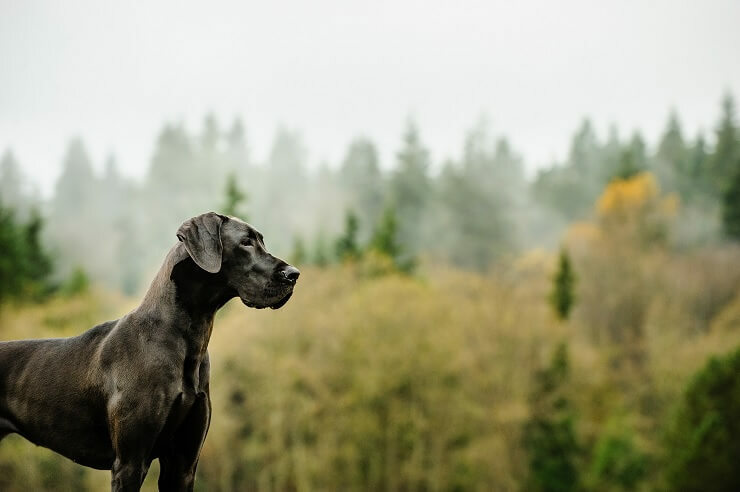 In this article we’ve broken down how much it costs to buy and own a Great Dane so you can fully understand what you are committing to with one of these gentle giants. How Much Does A Great Dane Cost? A great dane’s price can range from $600 up to $3,000. The exact price will depend on the breeder and the puppy’s pedigree. A pedigree dog is one whose lineage has been recorded, proving that it’s purebred. There is a huge difference in price between show quality dogs and dogs that are mainly bred as pets. Show quality dogs will have inherited their excellent bloodlines from award-winning parents. The breeders will have all of the paperwork including American Kennel Club certification. Whereas if you don’t want to show your dog, you can use recreational breeder. Many of these breeders produce lovely Great Dane puppies for much cheaper prices. 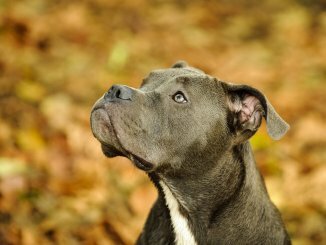 If you do enough research into these breeders, you will stumble across a wonderful dog. Most non-show Great Dane breeders will charge around $1,500 for a puppy. If you don’t want to buy a puppy, have you considered adoption? Adoption fees are usually around $150, which is much cheaper than buying a puppy. Many Great Danes end up in shelters due to situational issues and are genuinely lovely dogs. It may be worth phoning local shelters and asking around. However, owning an adult dog does come with its own set of challenges. It’s harder to train an older dog and working with behavioral issue may take some time. An older dog does have benefits though. Generally, they are already toilet trained. Most of the time they will have some basic obedience training. They’re also much calmer than puppies on the whole. When adopting from a shelter, they will normally give the dog a full health check. This will help find out any issues that have developed or are likely to develop. They will also have been spayed or neutered. Having all of this done for you will reduce the money you would have to pay if you purchased a puppy. If you’re buying an adult Great Dane from their owner, the price will be dependent on the dog. For a show quality dog that’s been fully trained, they will be fairly expensive. If someone is just unable to keep their pet any longer, the price is likely to be lower. The average price range of an adult Great Dane will vary between $100 to $400. It’s not just whether a Great Dane is a puppy or an adult that makes a difference to its price. There are many other factors that could will impact the price of a Great Dane including: age, lineage and certifications. We’ve discussed the difference in price between a puppy and an adult. But what you may not realize is that even the puppy’s age in weeks can affect their price. The ideal age to buy a puppy is 8 to 12 weeks. This is when most people want the puppies and the breeder is able to ask the highest price for them. As the puppies increase in age, their price will go down. Once they reach a year old, you will see a significant drop in price. Remember if you do buy them as a pup, it’s likely you will be paying for the pup’s vaccinations and treatments. Expect to be paying between $125 and $480. 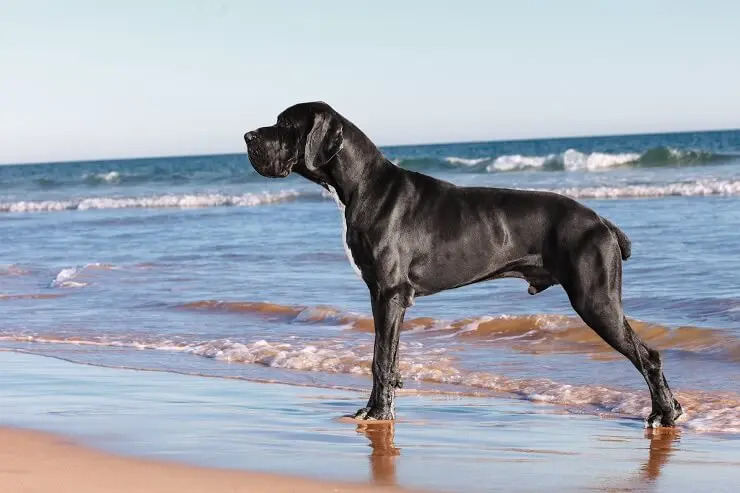 Show quality Great Danes have to have a black, fawn, blue, brindle, harlequin or mantle coat color (these are the only ones accepted for showing). Great Danes that have a coat color different to one of these, such as merle, will often be cheaper. At the moment the harlequin coat is the most popular color, so they are the most expensive. 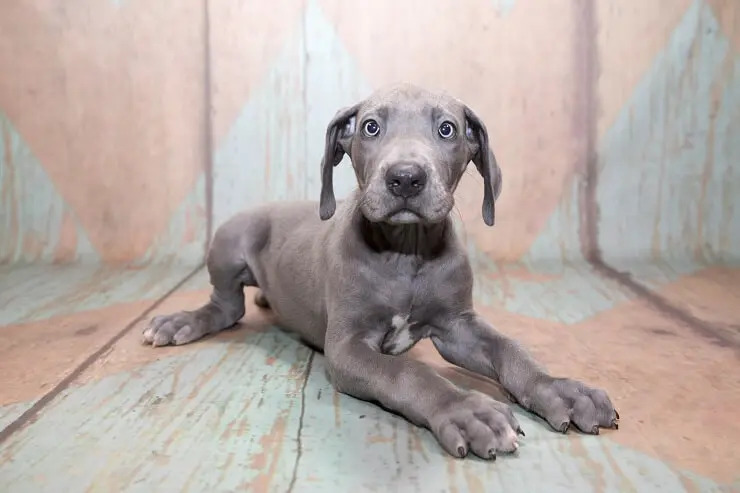 Also it’s worth mentioning that white Great Danes are more susceptible to genetic defects and are likely to cost less than the other puppies in a litter. There isn’t much difference in the price of a male or a female puppy. Males do tend to grow larger than the females though. So this means they will need more food, medication, bedding and so on. This will almost certainly mean the upkeep of a male Great Dane is more expensive in the long run. If the puppy has award winning parents or grandparents, then they are considered to have an excellent pedigree. The higher quality a dog’s pedigree the more expensive they are. If you want to show your Great Dane, this is definitely something you should consider. If showing is not something you are interested in, you will save money by looking for pups without a fancy pedigree. Your location can also impact the price of puppies. If you’re located in an area with lots of Great Dane breeders, then competitive pricing may work in your favor. If there is only one local breeder, then they’ve cornered the market and can charge what they want! Different areas will favor coat colors differently. Some areas may charge more for Merle dogs as they’re in high demand. With breeders, a good general rule is that the more care taken of the mother, the more expensive the puppies will be. If a breeder is registered with the American Kennel Club, they have to meet certain standards. This means they will have to pay more towards the upkeep of their dogs than someone who is not registered. Another factor to consider is the price of veterinary care. If they use a specialist Great Dane veterinarian, this will increase their prices as well. Breeders that pay for sires with excellent pedigrees are also going to charge more for their puppies. Also related to breeders is the certification your receive with your dog. Certification from the American Kennel Club has the biggest impact on a Great Dane’s price. The certification process costs a huge amount of money. The big benefit for you as a buyer is that it lets you look into the pedigree of the dog, in addition to their temperament and medical history. 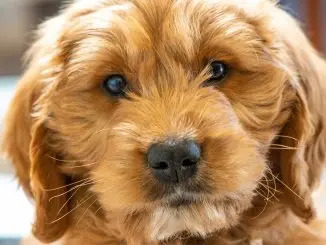 Breeders that can prove (through certification) their dogs are in excellent health with a strong pedigree are able to charge more for their puppies. Buying a Great Dane is only one part of the overall cost of owning a Great Dane. There is also the cost of maintenance. These are all the costs that build up over time. You may not think too much of them at first but over the 8 to 10 years a Great Dane is expected to live, these will really stack up. The cheapest option for training is to do it yourself. If you have loads of experience training dogs, you will feel comfortable striking out on your own. But if you’re less experienced at training dogs, we’d recommend attending some puppy training classes. You also have the option for one-to-ones with trainers. Be sure to do your research into any trainers. Ask your other doggy friends for advice as well. You should expect to pay $5 to $20 for group classes and $20 to $150 for personal lessons. Some places do provide boarding classes. This is when your dog goes and spends days or weeks in a dog training group. These are quite expensive but may be worthwhile, especially if your dog has issues with socialization. Day to day, the grooming of a Great Dane isn’t too expensive. You will need to invest in a good bristle brush to keep their coat healthy. When it comes to washing your Great Dane, this is where you may want to use a professional. Due to their size, washing a Great Dane is a real challenge and the professional equipment that groomers own makes the process much easier, quicker and less stressful for your pooch. They should be going to their groomer every 6 to 8 weeks. Depending on which groomer you use, they will charge between $40 to $120 per grooming session. A routine veterinarian checkup is likely to be between $20 and $75, providing there is nothing wrong with your pup. You should go for checkups like these around once a year. These visits are important as your vet will be able to catch any conditions early. 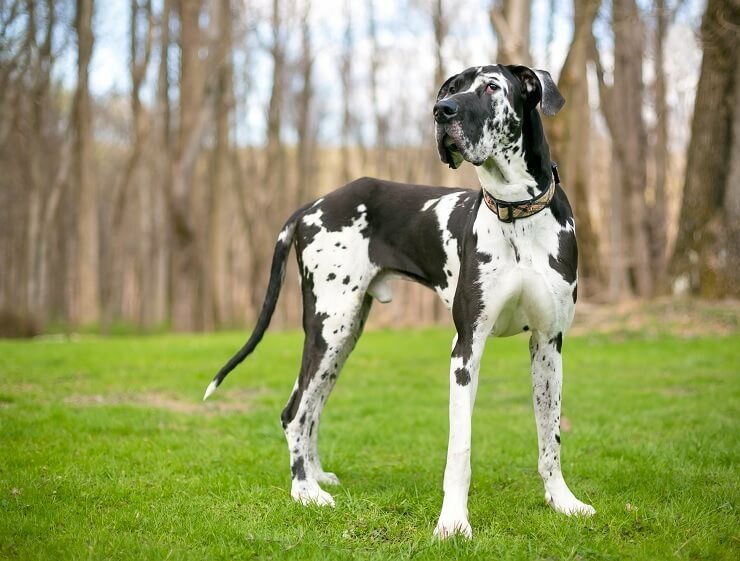 Unfortunately, purebred dogs like the Great Dane are more susceptible to health conditions. The bigger the dog, the more antibiotics they need. The more antibiotics they need, the more expensive it’s going to be. Antibiotics for Great Danes can be anywhere from $10 to $200. Bloat is a common issue for Great Danes. If your Great Dane develops bloat, the price to operate is between £1,000 and $5,000. You could have a gastropexy which reduces the risk of bloat but this costs around $500. This surgery is sometimes offered alongside a spay or neuter to reduce the price. For neutering, you are looking at $125 to $400 and, as a spay is more complicated, their price ranges from $200 to $600. Hip dysplasia is another concern for this dog. Hip dysplasia operations cost thousands of dollars. Regular vet visits will be essential for catching this early and putting treatment in place to prevent the need for expensive surgery. Lastly, the Great Dane has an oversized heart. Not in a cute way, unfortunately. It’s actually rather dangerous for them and can need medication to treat it. This is going to cost $500 to $1,500 a month. The medical bills we’ve just talked about are scary. The best way to stay ahead of all of those costs is to invest in pet insurance. You’re likely to pay around $50 per month. This should cover most basic claims. Generally, the more you pay into an insurance policy, the more cover you’re going to receive from it. Go for the best policy you can afford – it is worth it in the long run. Providing good nutrition for your Great Dane is one of the best preventative measures for many of those scary medical conditions we mentioned. Paying a little extra money for good quality dog food is going to be worth it. They are different from most dogs as they don’t require a puppy food blend. They grow quickly and don’t need the extra help that puppy food provides. Once fully grown they will consume around 2,500 calories every day. With a high-quality kibble diet, you should expect to be paying around $70 to $100 every month. There are a few extra items you’ll need to buy. These are generally the fun things to spend money on. Items like: crates, beds, bedding, food and water bowls, as well as an assortment of different toys, a collar, a tag, a harness and a lead. How much you spend on these items is entirely down to you. One other miscellaneous cost you should consider is transporting your Great Dane. This extremely large dog is not going to fit in a small car. A people carrier or SUV is more the sort of size you’ll need. Due to the large price tag of a Great Dane, it’s important that you find a good breeder. Using a good breeder will reduce the chances of genetic defects in the puppies. This is going to save you money in the long run. The Great Dane Kennel Club of America has set out an ethical code for breeders. A good breeder will have excellent reviews from previous buyers. You should be able to see for yourself that the mother and puppies are kept in a safe, clean environment. You should be able to meet the mother of the puppies and possibly the father as well. They should be able to provide you with all the appropriate papers and certifications. Documentation on health screenings for hip dysplasia should be available as well as any other medical records. Breeders may also ask you about your home environment, for instance, whether you have a fenced yard, what your plans for training are and so on. The higher the quality of the breeder, the more information they may ask for. Some require you to take your Great Dane to obedience classes and to give them your veterinarian’s information. Warning signs of a poor breeder are if they always have puppies available. If something feels off or you’re being pressured into buying, walk away and find another breeder. Now that you have read this article, you should have a good idea of the cost to buy and raise a Great Dane. Owning a Great Dane is a joy and will be some of the best years of your life. It’s important that before you commit to this giant dog, you fully understand how much they cost. Keeping one will have a massive impact on your life and it’s not a decision to take lightly! It’s important that you are realistic when it comes to these amazing dogs. They deserve to live the best lives they’re able to. That said, they are amazing pets who will repay you one hundred fold in love.